Heller & Usdan were Hugo Heller (1867-1922) and David Usdan (1892-1966). Hugo Heller was born in Bohemia. His naturalization record states that he was born 20 Nov. 1867, that he arrived in New York June, 1881, and that he became an American citizen 26 Aug. 1889. He began as a paper dealer at 225 Greene St., New York, in 1905. 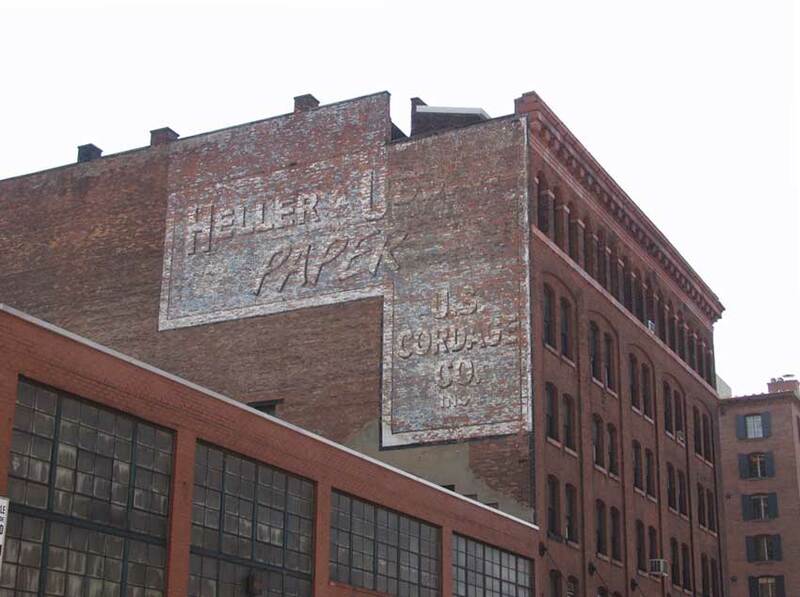 This company, H. Heller & Co., became Heller & Usdan at 78 Greene St. around 1919/1920. David Usdan's passport application in 1920 states that he was born 9 June 1892 in Glozovo Province, Minsk, Russia (probably what is now (Feb. 2009) Grozovo, Belarus, about 50 miles south of Minsk). This passport application had an attachment with the letterhead reading "H. Heller & Co. / Paper and Twine / 78 Greene Street," with "Heller & Usdan: Succrs." stamped at the top (click for image). Usdan was on a mercy mission home to rescue relatives from wartorn Poland/Russia and writes in support of his application, "I desire to go to Minsk, Poland, for the following reason: Because of the ravages of the war, and the terrible conditions now prevailing there, my parents and sisters are utterly destitute, in dire want, and suffering because unable to obtain the barest necessities of life. My two brothers and I are in prosperous circumstances, and I desire to bring them to this country where we will establish a comfortable home for them." Heller & Usdan arrived late to 401 Washington St. (the building is on the southeast corner of Laight St.): about 1944. They stayed at this location until leaving New York in the late 1960s. As of Feb. 2009 they are located at 7 Caesar Place, Moonachie, New Jersey, where their products are described in www.superpages.com as Cordage, janitor equipment & supplies, labeling equipment & supplies, office supplies, rope, adhesive tape, packaging machinery and paper converting machinery. Heller & Usdan also did business under the name U. S. Cordage Co. Inc. Probably this was the twine side of the business, while Heller & Usdan did the paper.